Successfully Added Mini Video Security Camera "Dark Wolf" - Nightvision, Weatherproof, PAL to your Shopping Cart. 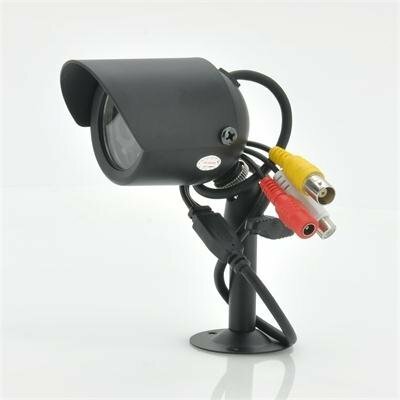 Mini CCTV Security camera with 1/3 Super High Vision CMOS sensor, PAL encoding, 12 IR LEDs for Night vision, an extremely weatherproof durable case and more! Easy to install, the “Dark Wolf” is your ultimate security camera! Looking for a convenient and discreet solution to improve the security of your home or office? Then the "Dark Wolf" Mini Video Security Camera will definitely meet your expectations. It's small enough to fit in the palm of your hand and can be placed in any corner or crevice in the room. At night, watch as it blends in perfectly with the dark and silently keep an eye on all that's going on. You don't want your whole security system disabled by a falling tree branch, and you certainly don't want to find it broken after being roughed up by a few would-be burglars. That's why the "Dark Wolf" Mini Video Security Camera comes rough, tough, and ready to serve in its full metal shell. Whether you're in a civil war zone or just feeling a little insecure at home/office, the "Dark Wolf" is ideal choice for protection that won't let you down. With 12 LED lights for automatic infrared nightvision, the "Dark Wolf" Mini Video Security Camera is ready at any time. Sunny mornings, dark nights, this is one security camera that never rests. You'll also love the included mounting brackets and adjustable angles, making installation quick and painless. This Security Camera could easily sell for much more, but thanks to our strong purchasing power we can now bring you this amazing surveillance device at an unheard of factory direct low price! If you’re looking for a Security Camera with great performance, advanced functions and simplicity of use, then look no further. Order now while supplies last. Brought to you by the leader in wholesale CCTV cameras, Chinavasion. This model is compatible with PAL TV systems only.